A lot of homeowners will tell you that the ideas for their Massachusetts bathroom remodeling project just sort of “fell together” or “came together” as they picked the various materials for their renovation. However, the best way to get the look and feel that you want for this essential space is to be more intentional about your selections. Everything from bathroom vanities and cabinets to the hardware for cabinets and drawers should be chosen with a particular theme, style, or purpose in mind. Before you purchase any materials for your bathroom remodel in Southeastern Massachusetts, make sure that you have an idea of what you want and what you want to accomplish with this project. One way to reduce the amount of time spent lamenting over tile patterns and backsplash colors is to figure out what you want before you shop. One way to do this is to start by looking at colors. The color of your Massachusetts bathroom remodeling project should reflect the rest of the designs, colors, and patterns in the spaces closest to the bathroom, as well as throughout the rest of the home. A master bathroom project should include some of the colors, wood types, textures, and decor used in the master bedroom. A guest bathroom remodel in Southeastern Massachusetts should coordinate with the living space or area where visitors to your home will be welcomed. A child’s bathroom should include all of the features, functions, and fun colors that you would expect to see in a space made for children. Look for inspiration in lots of different places. Check home remodeling websites online, search Pinterest, look through home decor magazines and how-to books. Watch home improvement programs on television and get an idea of how all of the latest colors, textures, styles, materials, and trends work together. Don’t think about “how much things cost” at the beginning, just start collecting ideas so you can see what it is that you want to use in that space for your bathroom remodeling project. You can choose bathroom vanities and cabinets later that will work with the style or color scheme that catches your attention, but for now, the focus should just be on collecting images and putting them together so you can choose a complete design for your bathroom. The next step is to take all of the information that you have gathered in the form of bookmarks, websites, magazine clippings, and photos to create an actual plan. Make a list of all the materials that you will need for your bathroom remodel in Southeastern Massachusetts and don’t leave anything out. Consider making three different design options so you can easily switch to a more affordable design if your first favorite is too costly. Your Massachusetts bathroom remodeling project will need to include flooring, paint or tile for walls, shower/tub surround, shower screen/glass/curtain, bathroom vanities and cabinets, hardware for cabinets and drawers, faucets and showerhead, lighting fixtures, mirror, window treatments, and other decorative accents. 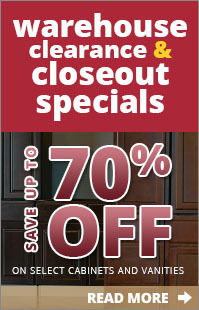 Plan a trip to visit our showroom at the Cabinet Factory Outlet. We have a large selection of materials that you can use to get started on your plans for a bathroom remodeling project. Choose from vanities, cabinets, cupboards, and specialty cabinets, as well as hardware, countertop materials, and accessories. Once you have your bathroom vanities and cabinets chosen, everything else can begin to fall into place. 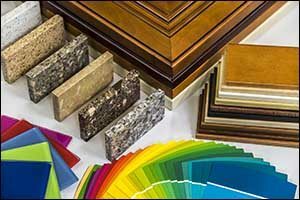 You can bring a sample with you when you shop for flooring, wall colors, fixtures, and other elements so you can make sure that everything will match. Other decorative pieces can be added later, including rugs, linens, candles, floral arrangements, plants, and anything else that you want to include for your bathroom remodel in Southeastern Massachusetts. If you are selecting all of the materials yourself instead of working with a professional decorator to save money, make sure to think about some of these top tips from the pros. When it comes to metal finishes for your faucets, showerhead, fixtures, and trim try to use no more than two different types at most. Most designers will try to steer homeowners to sticking with a single metal finish for everything from towel bars to door knobs on cabinetry just to keep everything cohesive. The same goes with tile selections. If you have one tile on the floor and another on the wall for the shower or tub surround, backsplash, and other decorative elements, that’s enough. If one tile has a pattern and color, the other should coordinate with a more neutral, simple design. Start your journey to a brand new bathroom by visiting our showroom on Grand Army of the Republic Highway in Swansea, MA. We are open Tuesday through Saturday from 9 am to 5 pm and can be reached by phone at 508-379-6154. Contact our team if you have any questions or would like to learn more about our selection, specials, or options for Massachusetts bathroom remodeling materials.